This post is brought to you courtesy of the rivalry and camraderie between Te Papa staff who have science degrees, and those who have arts and business studies degrees! What makes the Taningia Danae (or Squddly as we affectionately called her) special in this case is that instead of the usual large feeding tentacles one would expect to find, the Taningia has light-producing organs on the end of its. Bruce, our collection manager who hosted this trip, explained that the light-organs are a sort of eye, the light from each relevant tentacle beams out ahead of the squid and it can then sense the proximity of its dinner – much like the beams that guide aircraft or missiles etc. 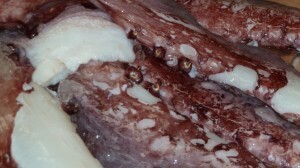 And once the dinner gets into the clutches of the tentacles – what out for those rows of sharp teeth-like hooks! 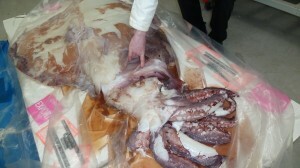 Bruce was of the opinion that the short tentacles of this particular squid, and the large body was a record for Te Papa, in that one of these relevant dimensions hadn’t been found thus far. For more information of research done chronicling the Taningia Danae – head to the Cephalopod Page. And, this trip wasn’t just restricted to learning about squids – a colleague and I were also given first hand experience of the preparatory work sea-life scientists do to examine their specimens. We had a moment of down-time while Bruce gathered some colleagues to help manoeuvre the squid onto an exam-table, where his colleague Andrew was working through his consignment of new specimens – when he came across a hagfish (made more famous thanks to the work of his colleague Vincent). If you’ve seen the videos already, you’ll know that the hagfish deters its predators through the instantaneous and somewhat explosive propulsion of slime (or more affectionately referred to as snot). Well, it can be a fair assumption that as Hagfishes die through trawling, or other non-being-eaten causes that they die with a certain level of slime/snot still in their bodies. 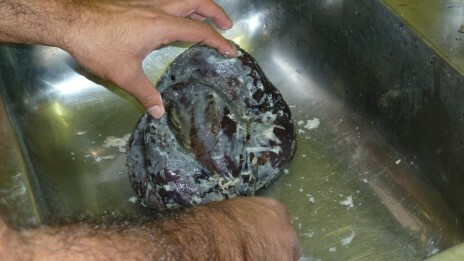 We discovered first hand just what the snot was like when it froze on the skin of the hagfish. So, the challenge was laid down, from scientists to artsy/businessy types, come and scrape out the snot! Look at that snot! – Of course, what they don’t capture is the moment in which my colleague sighed and said “actually this is quite therapeutic”. And just in case you wanted to know – yes, it felt just like human phlegm. There’s also video footage, and as soon as I can get the video editing softwares to work, I will post the action shots of the team discussing the find, the preparation of the squid for storage – and the scraping of the snot!